The osteostracans and heterostracans (see above) were not the only heavily armoured fishes in Silurian and Devonian seas. The placoderms, found largely in the Devonian, bore similar bony carapaces over the regions of their heads and shoulders, but in all cases these bony shells were mobile. There was a special neck joint that allowed the anterior portion of the head shield to be lifted. Placoderms were the first vertebrates to have paired pelvic fins. The Placodermi includes six clades (Denison, 1978; Goujet and Young, 1995), listed in phylogenetic sequence from most basal to most derived (Goujet, 2001; Smith and Johanson, 2003): Acanthothoraci, Rhenanida, Antiarchi, Petalichthyida, Ptyctodontida and Arthrodira. The arthrodires form the largest group, and they will be described in most detail. The arthrodires, nearly 200 genera, make up more than half of all known placoderms, and new taxa are still being found (see Box 3.3). The Mid-Devonian form Coccosteus (Miles and Westoll, 1968) has a trunk shield that covers only part of the dorsal surface, and it extends back as far as the shoulder region below (Figure 3.13(a)). There are paired pectoral and pelvic fins, both supported by limb girdles, but much smaller than in sharks. The tail is heterocercal, and there is a long dorsal fin. The posterior part of the body is covered with small scales, but these are rarely preserved. It is likely that Coccosteus was a powerful swimmer, achieving speed by lateral sweeps of its tail and posterior trunk. Its flattened shape suggests, however, that it probably lived near the bottom of seas or lakes. The head and trunk shields (Figure 3.13(b, c)) consist of several plates, and there is a gap (the nuchal gap) between the head and trunk shields at the line of hinging. 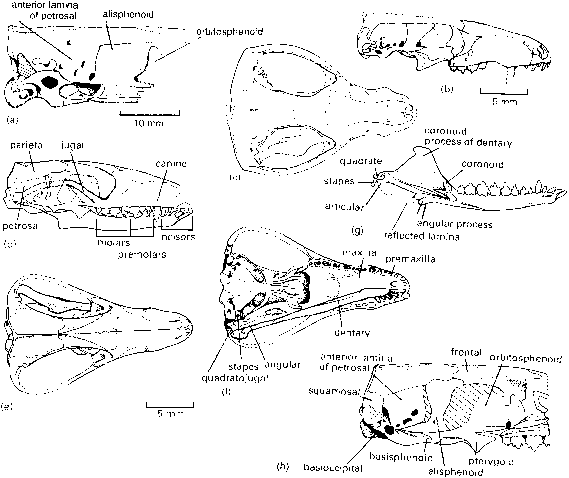 The lower jaw plates join weakly in the middle (Figure 3.13(c)), and their dorsal margin is worn to a sharp edge against a series of eight small plates in the upper jaw. These are not teeth, but they wear into equally effective sharp beak-like plates that would have been capable of an effective cutting, puncturing and crushing action. True teeth have been claimed in the arthrodires (Smith and Johanson, 2003), an unexpected discovery, suggesting a separate origin of teeth in this clade and in the other gnathostomes, although this has been disputed (Young, 2003). Arthrodire teeth are located inside the mouth, behind the main shearing bone plates at the edges of the jaws.